Eight birders (Bill & Mary, Lorna, Terry, Jim, Mike) joined me this morning on an uncharacteristically sunny Monday morning outing to Iona Regional Park and the next door Sewage Lagoons. Even Roger showed up for a cameo appearance before he and his Rose left for Hawaii this afternoon. Hi-lites were: Virginia Rail, several Yellow-rumped Warblers, Yellow-headed Blackbird, Common Snipe and many waterfowl in breeding plumage. See photos of this outing (hopefully soon) on our Picasa site at: http://picasaweb.google.com/dncbirding. A nice silver male Northern Harrier cruised in front of us as we drove beside the Airport toward Iona. Many Green-winged Teal in the Bay. It was a bit chilly when we arrived at the parking lot and there were only a few Scaup and Bufflehead in the front pond. We walked to the north pond and a few of us saw one of our “destination birds”, the lone Yellow-headed Blackbird that only occasionally rose up in the reeds for viewing. Hopefully more will arrive soon and successfully breed there. A few colourful Ring-necked Ducks and American Coots were also in this pond. Lots of Swallows flying around; we identified Tree, Violet-green and a couple of Cliff, but did not see any Barn or Rough-winged which others have seen there. We met Mike Boyd and his crew of bird-banders and he posed with a beautiful male Yellow-rumped Warbler. They were also processing a Song Sparrow and a female Red-winged Blackbird. We continued through the back gate of the Sewage Lagoons where workers there meant that the birds were on the other side of these ponds. However, we got good looks at mixed flocks of some beautiful waterfowl in breeding plumage including: Northern Shovelers, both Greater and Lesser Scaup, Northern Pintail, Gadwall and American Wigeon. Two Greater Yellowlegs were the only Shorebirds we saw in these ponds. Returning to Iona RP, along the back trail pairs of Tree Swallows were hanging around the nesting boxes. 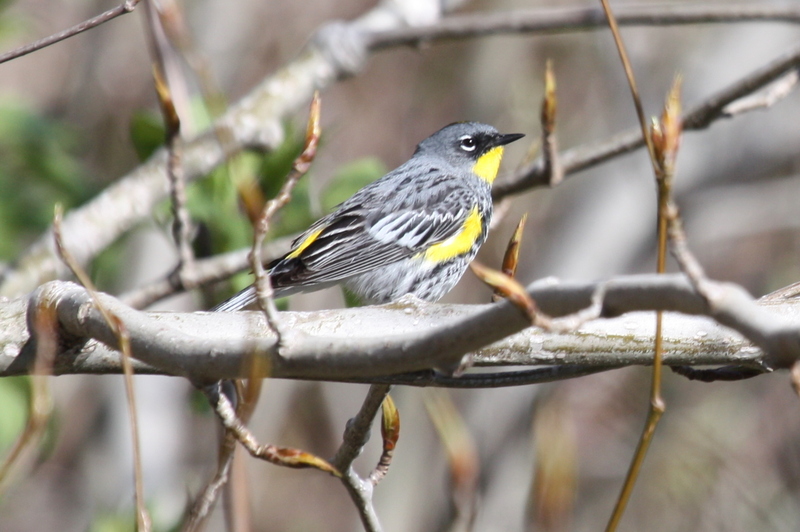 We heard several and saw one Marsh Wren and then several Yellow-rumped Warblers posed fleetingly for us. We rousted a Common Snipe; nice sighting. We did not see any Mountain Bluebirds, Northern Shrike or Caspian Terns which had been reported there, and no Purple Martins were seen near their nesting boxes along the Fraser River. Our other “destination bird”, a Virginia Rail was calling loudly and constantly. After circling and staring for what seemed like an eternity at the bush where the sound was coming from most of us eventually got good looks at this skulking and well-camouflaged bird, except Photog Terry who always seemed to be on the wrong side when the bird was in view. Hopefully Jim’s photo is decent. Back at the parking lot, some saw an Osprey, perhaps one of the resident nesting pair has returned. Others shared Lorna’s peanut butter sandwich (with cinnamon added) and lied about our almost-interesting morning outing and the many birds we didn’t see. I was kept awake on the ride home, not by Terry’s sleeping or Lorna’s constant laughing, but by Mike’s raving about his Scottish banking successes accompanied by Jim’s snoring. We had an enjoyable Delta Nats meeting tonight at Cammidge House with Coleen Doucette’s presentation on Rehabilitating Wildlife. Next week we will be manning our Delta Nature “hands-on” Display at Delta’s 9th Annual Watershed Park Fish Release on Sunday, April 17 and then again on Thursday, April 21 at Delta City Hall for Earth Day celebrations. Our next DNCB outing will be Wednesday, April 20 (not Monday), meeting at 9:00 a.m. at Cammidge House for a Birds on the Bay walk around Boundary Bay Regional Park (we may see Mountain Bluebirds). Comments welcome and tell me again if you want off this list.